Creates a database that connects topic names with email addresses, which we call a subscription. Modify the PostgreSQL writer’s connection parameters to match your PostgreSQL database. Note: the PostgreSQL host and port should be accessible from the machine you create workspaces on and the machine that has FME Server installed on it. At this point you can manually edit the database if you wish to add or edit the subscribers. 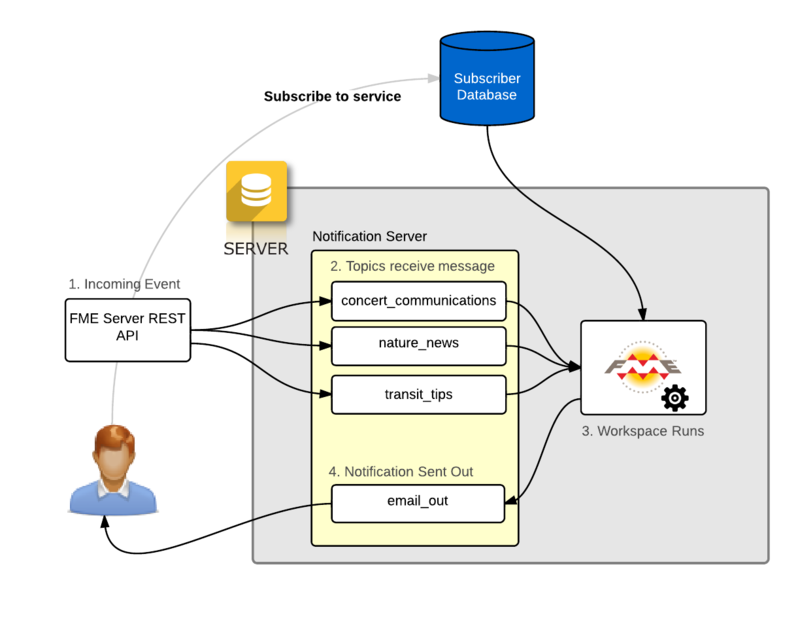 Here we configure a workspace and publish it to FME Server that will be called when a message is sent to the topic. Open the Joiner transformer and modify the PostgreSQL reader’s connection parameters to match your PostgreSQL database. Note the FMEServerEmailGenerator transformer, which will create the specific JSON required by the Email subscription. the feature written to the Text File writer will be sent to the email_out topic. 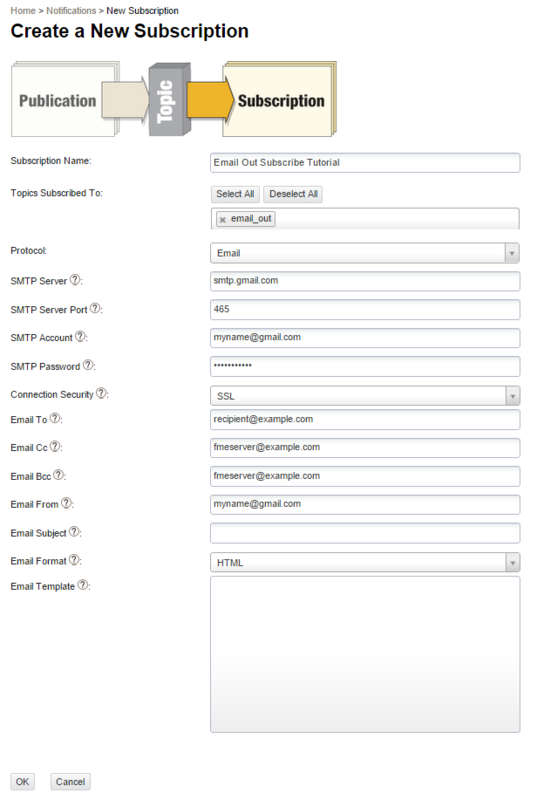 Open the web interface and create a Email subscription that is subscribed to the email_out topic. Now we send a test event to the topics. "message": "There was a sighting of a rare <b>warbleddash lizard</b> in South America!!!" You will prompted to login. afterwards click Try it out! again. You should receive an email to the address you specified for the nature_news topic back when you created the database. If you didn’t receive an email: try using the Monitoring page in the web interface to monitor the four topics and also double check subscription settings. "message": "Use transit to make my commute easier <i>:-)</i>"
Now you have a created a simple system for managing subscriptions to topics using a database.